I had wanted to call this post simply “Waiting” but then had a funny feeling that I had used this title before. It didn’t surprise me. We tend to do a lot of waiting here in Bolivia. It’s a part of life and, after 15 years here (plus 5 more in Chile), I can hardly be annoyed or too put out by it. I Googled to check my use of this title and, yep, there it was in August 2012. I went back to see what all the waiting had been about back then. 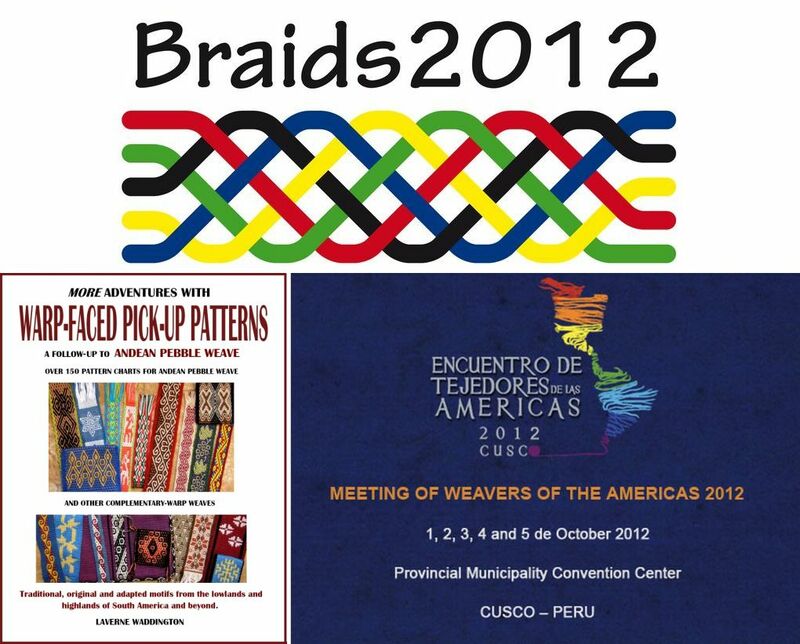 It was nothing to do with Bolivia at all…I had been waiting for some technical help with my second book and impatiently awaiting some exciting weaving events…all good stuff, as you can see below, and worth waiting for. This week has been about a different kind of waiting. It involved getting up every day at 4am and trekking out to the SEGIP office to stand in line and…..wait. SEGIP issues visas and ID cards for foreigners. My ID card had expired and I have been trying since the end of December to move the paper work along. The office opens at 7am. You have to be there in a queue at 4.30am to get one of the 80 daily appointments. You wait in the street in the pouring rain or sun…we had both… and there’s no shelter. I only wish I could entertain you with some nice shots of the sunrise or my fellow “waiters”. The sunrise was happening behind buildings and it was too dark most of the time for people shots. Today I succeeded! I was #46. I got to speak to someone. After the Monday morning failure to gain admission, it was kind of fun greeting and seeing my fellow “rejects” the following days. ….the Brazilian medical students…always in large groups, always jolly, fun loving, even in the rain, and very, very loud. …the Argentinians…recognizable by the thermoses that they carried and the little pots of yerba mate which they passed around and sipped and, of course, their gorgeous accent. …the Mennonite gentlemen with their denim overalls and baseball caps, the ladies with their head scarves, print aprons and straw hats. …the Russian Old Believer gentlemen with their long beards, piercing blue eyes and long, loose belted shirts. You have no idea how much I wanted to look more closely at those belts! They leaned on a fence with the Mennonites and talked about the recent rains on their land. There were some Mormon missionaries from the US looking so terribly young to be so far away from home. It was strange having so many foreigners gathered in one small place like that. Bolivian life is influenced in many ways by the cultures of its neighboring countries. 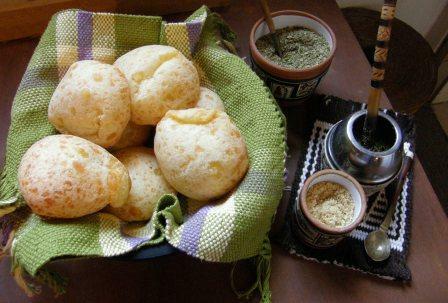 Above, you can see the baked Brazilian snack called cuñape that is very much enjoyed here, and a pot of Argentinian yerba mate sitting on some of my backstrap woven pieces….a nice piece of Mennonite cheese or a pot of Mennonite honey would make it the perfect tea time picture. The good thing is that, despite the wait and rejection on three days in a row, I managed to get home every day by 8.30am ready to face and enjoy a whole morning at the loom. That way, the pre-dawn expedition didn’t feel so much like wasted time. This is one of the things on which I have been working this week. It’s the circular warp that I took on my last US trip. 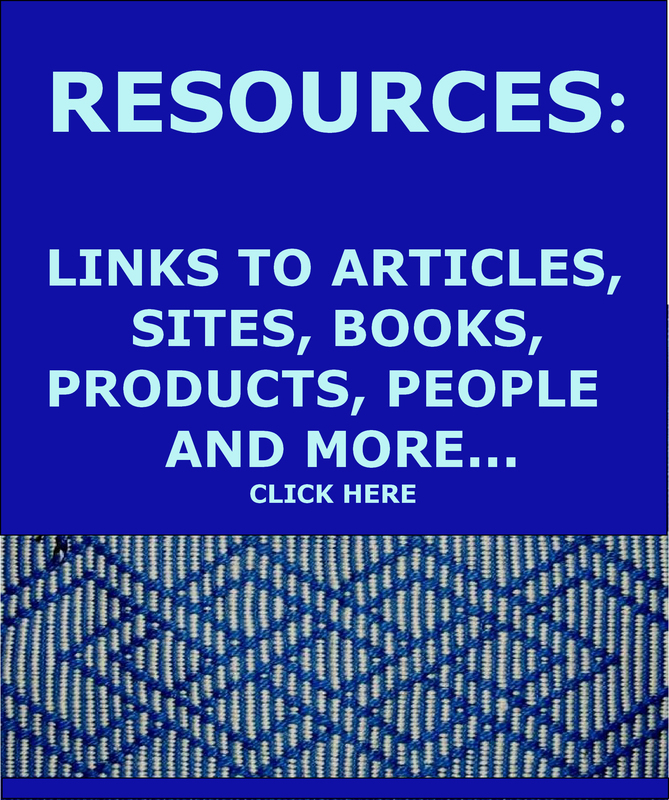 I use it to show friends the different parts of a backstrap loom including the coil rod. It’s been sitting here as just a white plain weave piece of cloth. I decided that it needed to have some pattern. That is one of the things I love about patterning with supplementary weft . You can just add pattern to your plain white “canvas” at any time without a whole lot of planning. This warp had previously held a butterfly motif which I pulled out and replaced with this leafy design. 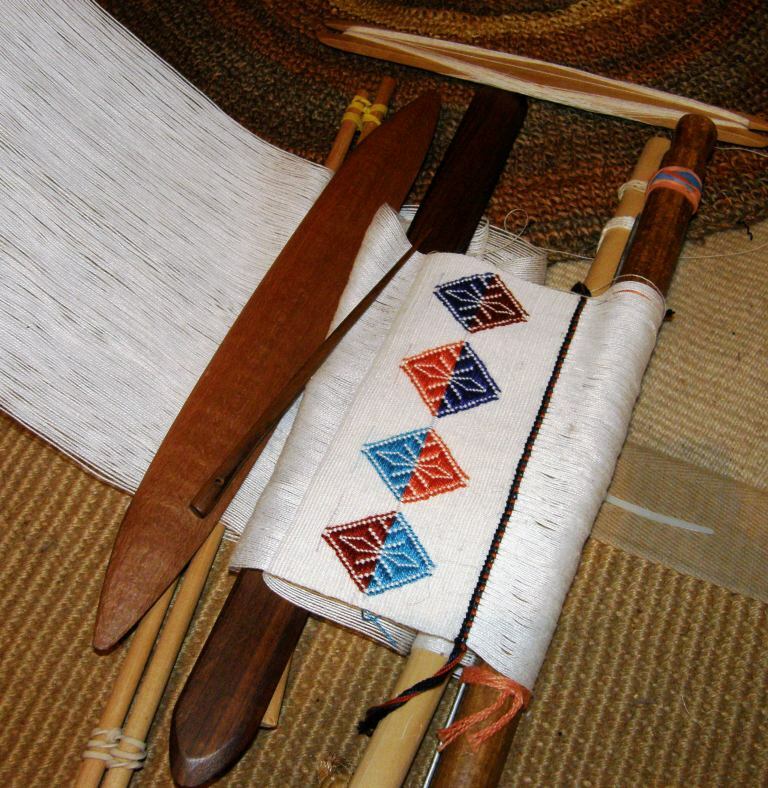 It’s interesting how different the same motif can look when woven with different materials. I created the leaf motif very recently for my discontinuous-warp experiment in heavy-ish wool. On that piece I had used wool as the supplementary weft. My circular warp is fine cotton and I used tencel for the patterning weft. I also used a closer sett than I usually do so that the fine white cotton would cover the dark patterning weft well. The leaves that had looked so robust in wool were thin and sickly looking in tencel on cotton so, I had to make adjustments to the original chart. 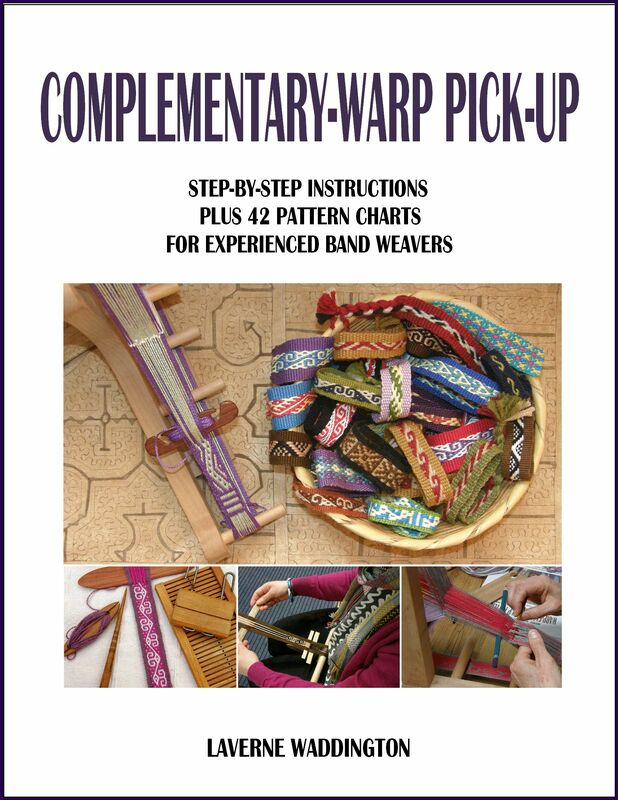 The good thing about the finer warp thread is that you can use longer floats in the pattern and that allows more flexibility and options in the designing. I could use longer floats than the five-span maximum I used in the wool project. On the other hand, the single-span floats I used on the wool piece would barely show up in the fine cotton. So, several adjustments had to be made to “fatten” the leaves and make the finer details more visible. I don’t know exactly where this pattern is going from here, but that is enough weaving for this warp for now. I placed the turns of the supplementary weft on the edge of the cloth rather than trying to conceal or camouflage the turns within the blue stripe as I usually do. I wanted to challenge myself to make consistently neat and attractive turns on the edge that would resemble little beads. I also turned the weft on the edge of the wool cloth. Those rather chunky turns are now hidden within the tubular edging. 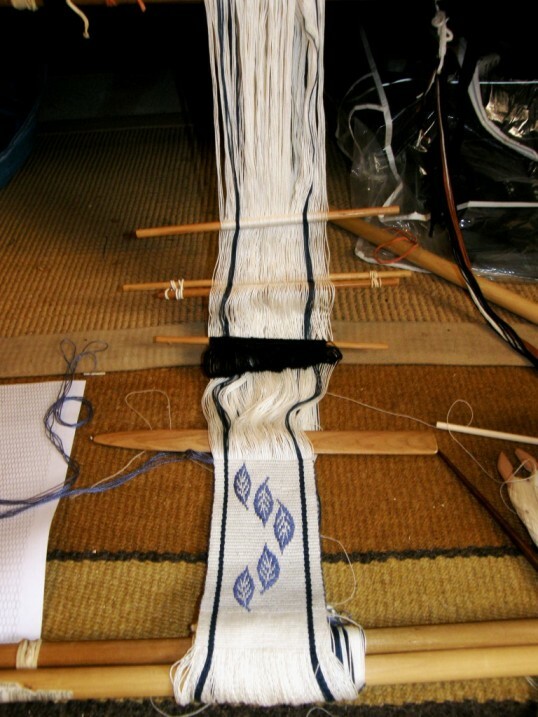 Above, you can get more of an idea of the circular nature of this warp and see the coil rod in position. The biggest difference I notice between weaving on a circular warp like this one and one in a single plane, is the ability to apply tension. There is a certain “springiness” to this circular warp which makes me feel like I can’t tension or beat as hard. This has me pushing with my feet (something I rarely do these days) in an attempt to apply more tension. 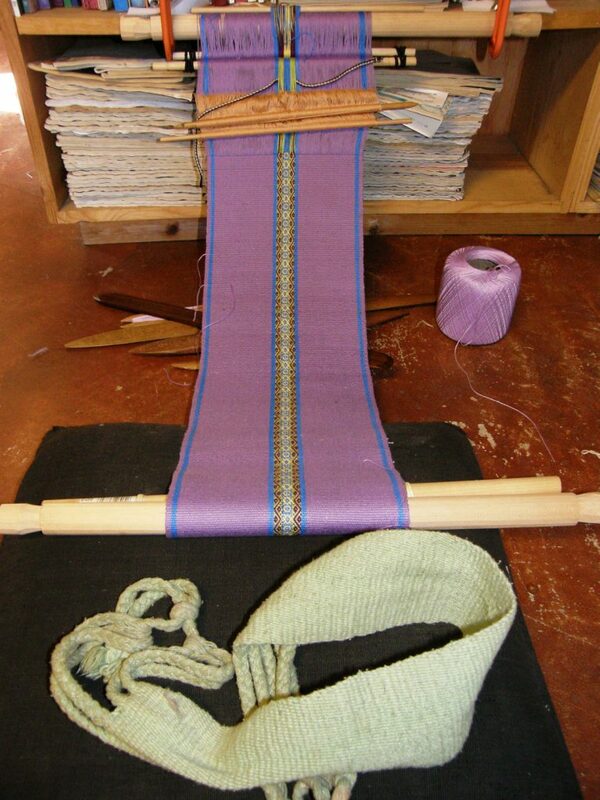 Maybe that is why the majority of indigenous weavers I have seen using circular warps brace their feet against something as they weave. It is interesting to be able to compare the feel of the two kinds of warp set-ups this way. Weavers in Ecuador using circular warps brace their feet against blocks of wood to help apply tension to the warp. 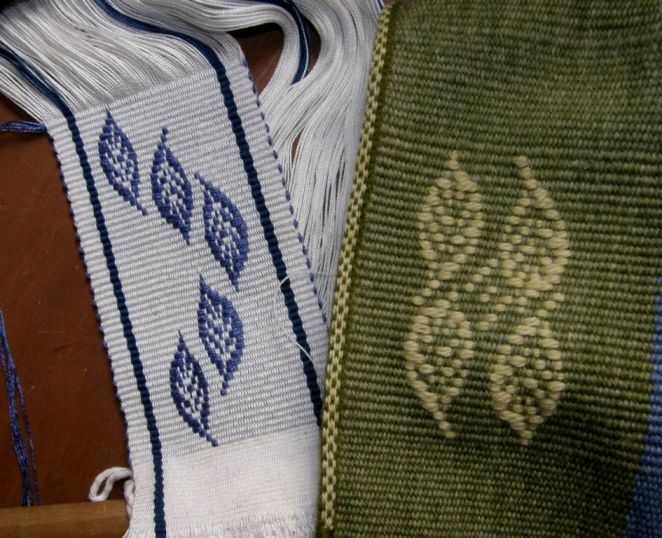 At first, I decided that it would be an interesting challenge to just chart and weave one leaf and then see if, by reading from the one motif woven into the cloth, I could flip the design both horizontally and vertically. The challenge wasn’t met as it gave me a big headache! and so I decided to chart the four versions and go from there. I wrote a page some time ago which I added to my list of FAQs on my thoughts about the use or non-use of charts. My latest wall hanging project uses a design I created and charted myself which is, for the most part, not symmetrical. It is a row- by-row slog working with an enormous pattern chart and was inspired by designs painted on cloth by the Shipibo people of tropical lowland Peru. 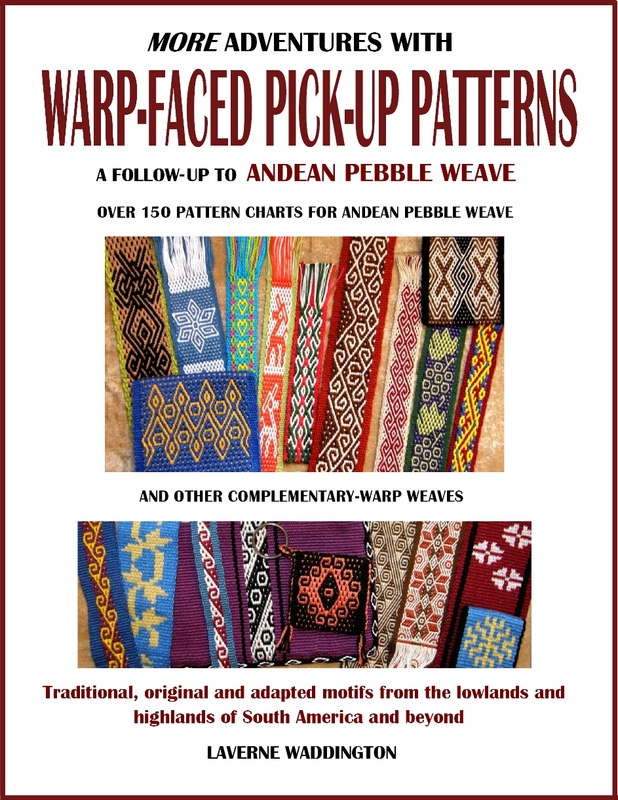 Fortunately, for me, warp-faced double weave is one of the easier structures for reading the pattern on the cloth because there are no warp-float lengths to be considered. Once a base line of pattern has been woven, it is easy and straightforward placing subsequent rows by referring to the preceding one without having to do a great deal of counting. However, there are no small design elements within the large one that get repeated and which can, therefore, be eventually memorized. The pattern is not one with which I am all together comfortable yet. What I mean to say, is that I am not sure that I like it yet! My eyes long for symmetry! I keep telling myself that I just need to WAIT (I have had plenty of practice with that this week! 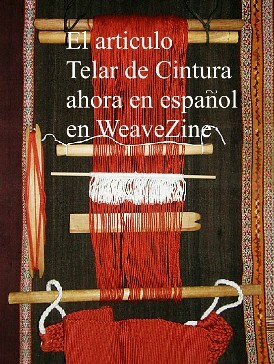 ), weave a bit more, walk away, stand back, weave some more and allow it to develop. It is a design that has a lot of wiggly chaos within a rigid symmetrical outline. That’s the best I can do to decribe it for now. I just need to put a bit more of that heavy symmetrical outline into place to help me deal with the chaos! I will wait. I won’t unweave. I feel confident that it will be just what I wanted in the end. I thought….wow, I remember that. 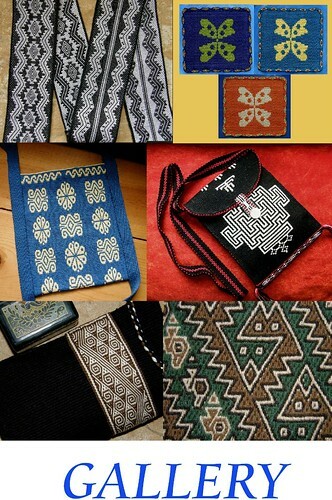 I wove it at the start of my studies of Bhutanese patterns. Now, what in the world did I do with that? A quick search in the closet turned up nothing. And then I remembered…oh yeah, I unwove it because I didn’t much care for it at the time…too colorful or something like that. Maybe I should have WAITED. At least I took a picture of it before unweaving. This had been a very hastily put together demo warp . I disliked the color combination so much that I didn’t even want to put it out to be seen. Nevertheless, I wove it off and sewed it into a pouch. Time has passed and now I just love my happy colorful sewing bag. It was another travel warp into which I hadn’t put much thought. I was pleased to at least be able to use the finished fabric from the above warp for a tutorial on edgings. 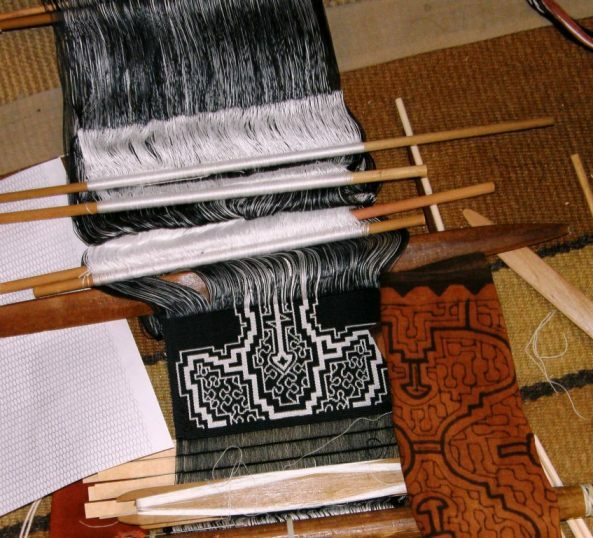 Scott is really getting into double weave and is now charting his own motifs. After working through my tutorial, he used the llama patterns to make keyfobs. I like those grippy keyfob ends…no sewing needed at that end. They are especially suitable for double weave which can be too bulky when folded and passed through a key ring. 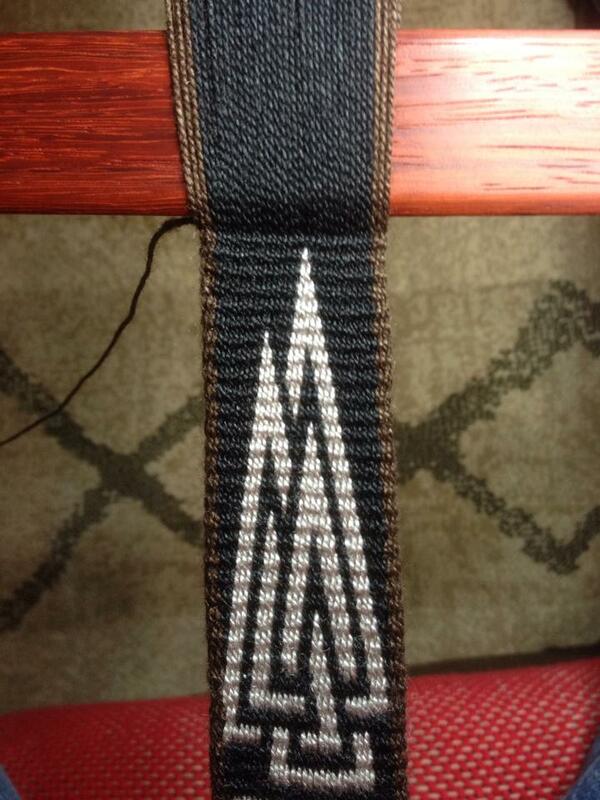 Next he charted and wove the Norse Valknut motif…love it! What a superb piece of work. 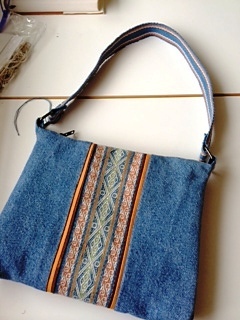 She used denim which so perfectly matched the washed-out blue of her indigo-dyed hemp. 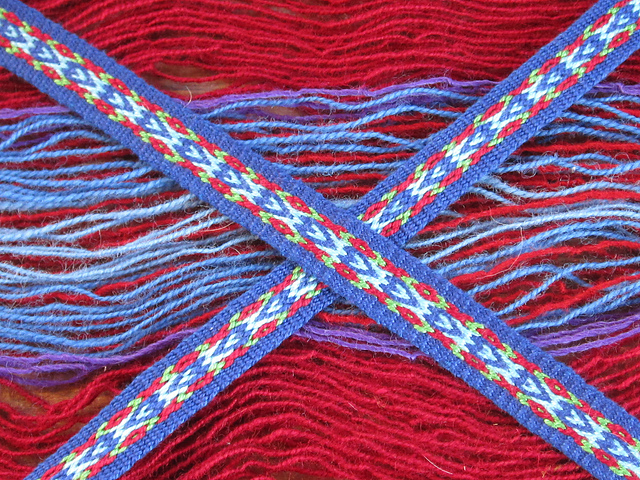 Other pieces of colored fabric were used to frame the woven section. She finished it with a zip. 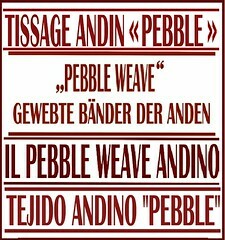 Lausanne’s band is a lovely example of how simple 2 and 4-revolution Andean Pebble Weave motifs can be placed together to make new designs…something that I discuss and encourage in my second book. I love the way she has photographed it. It is so nice seeing lots and lots of band length like that. 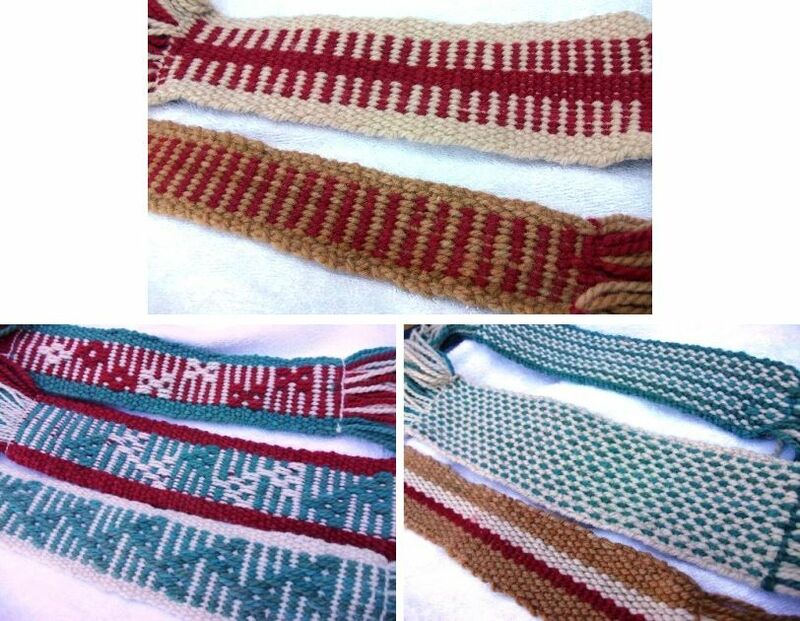 Teresa in Chile sent me pictures of her first backstrap loom pieces using the tutorials on my blog for creating plain-weave bands with solid colors, comb patterns, and stripes. 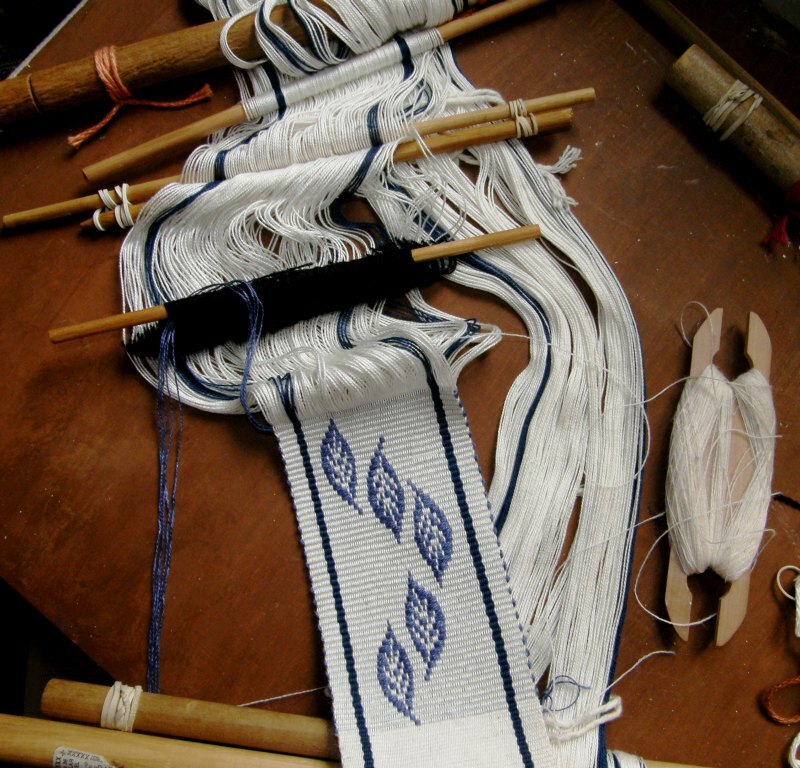 In this way she wisely develops and practices her skills in managing the backstrap loom with simple, fun, plain-weave projects. Now she is taking her first steps in creating patterns with warp floats. I am glad that I didn’t have to keep you waiting for this blog post. Blog day is usually a strictly “at home” day for me consumed with taking photographs, editing and writing. I am just happy that I don’t have to get up at 4am again tomorrow! I love that leaf motif! Thanks! I am glad that I could use it again so soon after having created it and see how it looks in totally dfferent materials. Thanks, Jessica. I won’t unweave and I am sure that by next week I will be feeling more comfortable with it. Hi Wendy! Supp weft is great, isn’t it?! I loved every photo on this post! 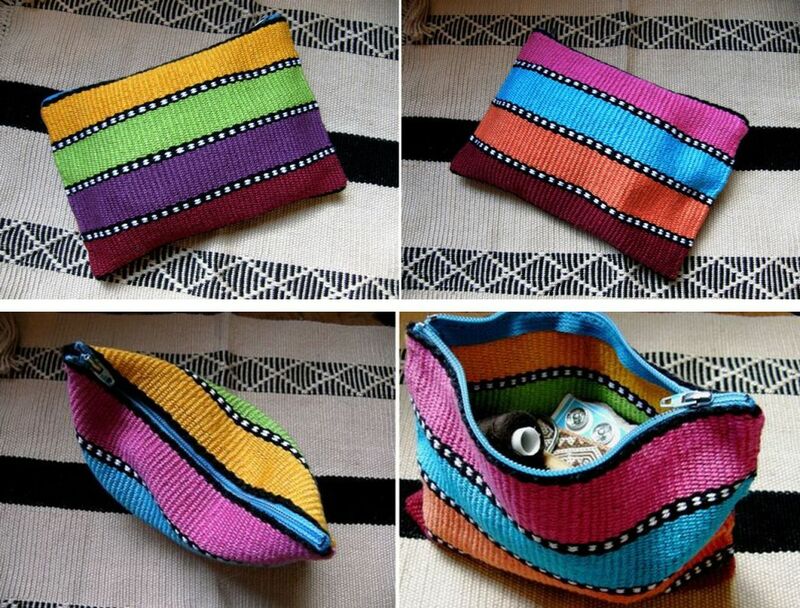 And the striped bag color combinations are pretty! I echo Jessica Norris above me in the comments when she says please do not unweave that black & white piece. It is so striking and beautiful. What alot of work! Gorgeous. I had no idea Old Believers and Mennonites lived in your part of the world. Why Bolivia? I can fathom the beauty there but is it difficult to settle, gain residency or permits? I am used to thinking of these groups of people only settling in the United States. Quite interesting. I love how you put a positive spin on the early morning waits at the Segip office, watching the other waiters and their backgrounds. People watching is a good way to pass time. It’s interesting how here in the west everybody seems pretty content waiting these days since the arrival of the smartphone. It’s quite funny in the train everybody glued to a little screen. You only notice it when you lift up your own head from your own little screen 🙂 Such a change from even a few years ago. Sorry, I’m diverting from your post. I agree with Jessica and Jennifer, don’t unweave!!!! Your Shipibo design looks awesome. Thanks, Anna. You are right. There were people with Smartphones in the queue but many more people without them than with them. 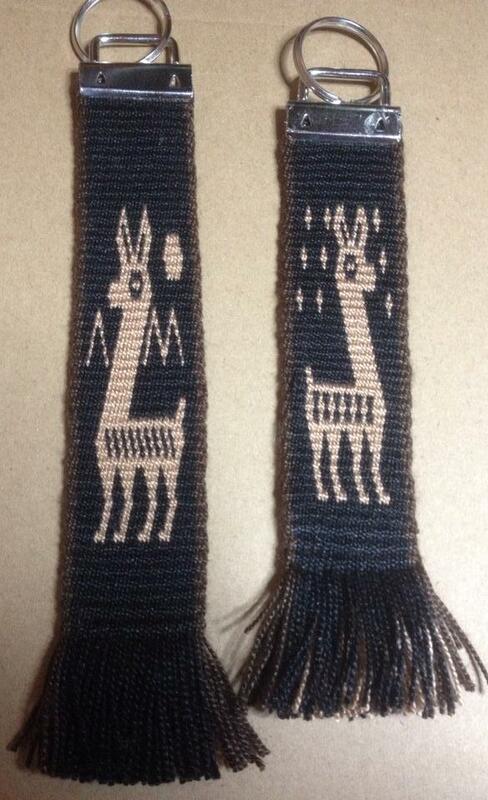 Thanks for the encouragement on the Shipibo piece.